If you are having trouble logging in to your FacilityDude account, first make sure you are on the correct website. *Note: If your organization is using SSO (single sign on) for user authentication, your login experience may be different. If you are having difficulty logging in using SSO or you are unsure whether your organization utilizes SSO for their Dude Solutions products, please contact your technology help desk for assistance. If you have forgotten your login name, click the Forgot Login Name or Password? link, enter your Email Address in the pop up window, and click the Forgot Login Name? button. An email will be sent to you with your login name. If you have forgotten your password, click the Forgot Login Name or Password? link, enter your Email Address in the pop up window, and click the Forgot Password? button. 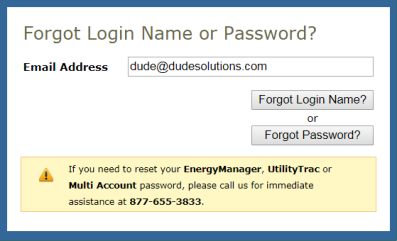 *Note: If you need to reset your Energy Manager, UtilityTrac, or Multi Account password please contact support for assistance. We will send you an email with instructions for resetting your password, check your email to find it. Click the link to go to the Reset Password page. If you are unable to click the link; highlight it, right click your mouse, and click Copy. In a new internet browser window, right click your mouse to Paste the copied URL into the web address field. Hit the Enter key to go to the Reset Password page. Enter and confirm your new password in the fields provided. 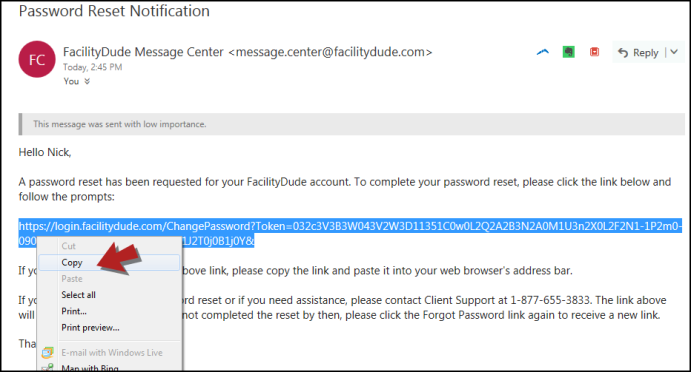 Once you have reset your password, the page will refresh to the FacilityDude login screen where you can enter your new password to login. When logging into your FacilityDude account, you must select which product you want to go into by selecting it from the Select Product drop down box. See the table below for short product descriptions that will help you figure out which product you need to select. The products listed in bold are the one that are most commonly used. Work Order Work Order management solution; enter, approve, and manage work order requests. If you have completed the above troubleshooting steps and are still unable to login, you may need to try clearing the cookies on your internet browser. Click here for examples of this process in common browsers. If you need further assistance, please contact your IT department.